Gomes is a renowned cave diver and holds the official current (2012) Guinness World Record for the deepest cave dive, done in Boesmansgat cave (South Africa), to a depth of 927 feet (282.6 m), in 1996. The cave is located at an altitude of 5000 feet (1550 m) above sea level, which resulted in Nuno having to decompress for an equivalent sea level dive of 1112 feet (339 m) to prevent decompression sickness ("the bends"). The total dive time was 12 hours and 15 minutes, while the descent took 15 minutes. "The tremors were quite intense by the time I reached the bottom, severe enough to make operation of my inflator difficult. My entire body began trembling, gradually escalation to uncontrollable shaking by the time I landed". On ascent, all of these symptoms disappeared by the time he reached - 102m. 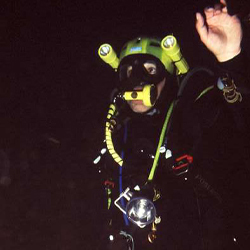 During the following years Nuno Gomes, the experienced South African cave diver (a civil engineer from Johannesburg), attempted to better Exley’s depth. In 1994 he made dives to - 230m and - 252m encountering decompression problems on both occasions. Two years later, in August 1996, Gomes returned to renew the challenge. An eight-strong team of divers, including a doctor, supported the attempt and, as an extra precaution, they assembled a surface decompression chamber. 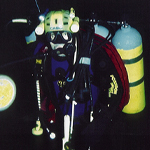 From earlier surveys and attempts it had become evident that an even deeper penetration was possible and on one of these bids, in 1995, Deon Dreyer, a young diver, had disappeared during a dive. In an attempt to locate his body his parents had hired a ROV (remote operate vehicle) to search the cave and, although the body was not found, the videotapes made gave the explorers a greater understanding of the nature of the cave. In 1996 Gomes was to descend a shot line that had with the aid of an air-filled drum placed against the roof at - 51m, directly over the cave’s deepest point. The line’s final position was thus at an angle of seven degrees from the vertical to link the entry point to the deepest point. By adopting a suitable dive profile Gomes was able to maintain an angled descent to follow the line. A chest - mounted cylinder of air took him to - 70m whereupon he transferred to one of his two side mounted cylinders which took him down to - 160m. At this point he changed to four back - mounted cylinders of heliair for the remainder of the descent. "Suddenly and unexpectedly the bottom came into sight, with only two of my torches still working (the two SabreLite beams lit up the bottom clearly; the other two torch bodies had been squashed by the pressure and the terminals were not making contact) my view of the bottom and moment of glory was short and sweet. I saw a lunar type landscape of grey silt with the odd small rock sticking out, and there was some slack rope on the flat bottom. There were holes in the grey silt where the weights had gone in, as well as a small ledge which I had to get past to reach the deepest spot about five meters away horizontally. There was only one way, I had to swim whilst taking up the slack on the rope. Since I was negatively buoyant and had no time to inflate the wings (buoyancy aids) I landed on all fours. 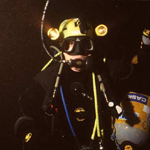 My worse nightmare came true: a silt-out at the bottom of a very deep cave with a slack guideline while on all fours and under the influence of nitrogen narcosis and helium tremors. My first priority was to stand up without losing balance or becoming tangled in or losing the line; the quads and two side - mounts did not help. I tried to swim up but failed and became dizzy. I relaxed and inflated the wings; it took 30kg of lift to ascend fifteen meters and get out of the mud and silt." Gomes had reached an averaged depth of - 282.6m! In assessing the significance of these Bushmansgat dives it should be remembered that this site lies at an altitude over 1,500/5,000ft. Although this has minimal influence on the difficulties of descent, when this factor is taken into account for decompression purposes the corrected depth becomes - 337m with the corresponding time and logistical implications. This twelve-hour solo operation was undertaken without the use of a diving bell or saturation system. Other items of equipment employed on this world record dive where Poseidon Cyklon 5000 regulators, Aladin Pro Computers, Dive Rite 60lbs redundant wings and Sabre lights chosen for their reliability at such extreme pressures. Despite the availability of more sophisticated equipment, Gomes remains convinced that this rig was the most suitable for the task. It is worth noting that his far larger supply of bottom mix (than that employed in the Zacaton dives) gave him a greater margin for error that allowed him to deal with the vicissitudes he encountered in the silted base of the cave. Completely autonomous deep diving penetrations such as those conducted at Zacaton, Bushmansgat and the Fontaine de Vaucluse are clearly edging towards the limits of human endeavour. Commercial diving, involving deep submersible bells and divers breathing though umbilical tubes, takes place at greater depths but there is no comparison between these two types of operation. Amateur sporting and exploratory pioneers such as Bowden, Exley and Gomes, are operating at the very limits of physiological knowledge and confronting infinitely greater risks. This diving is thus fraught with great hazard and Exley’s experience in Bushmansgat and his demise in Zacaton carries an obvious warning. 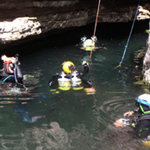 It seems that with the existing technology and knowledge Gomes’s Bushmansgat dive could not be repeated, even by Gomes himself, with any degree of safety assured. Extract from: THE DARKNESS BECKONS by Martyn Farr.